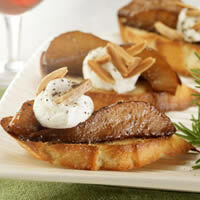 An earthy balsamic vinegar glaze provides the "pear-fect" balance between sweet pears and salty goat cheese. Slice pears stem side up into 12 quarter-inch width vertical planks. Cut large slices in half lengthwise for a total of 48 slices. Heat vinegar, butter, and honey in large frying pan, over medium heat for 2 to 3 minutes. Stir constantly, until reduced by half, about 2 tablespoons. Add pear slices and continue cooking for 1 minute turning once.